History did not record how Edvard Munch felt about being remembered by most people for just a 'single' work. It could be argued that he brought this on himself, having produced no less than four versions of his most famous painting, The Scream. 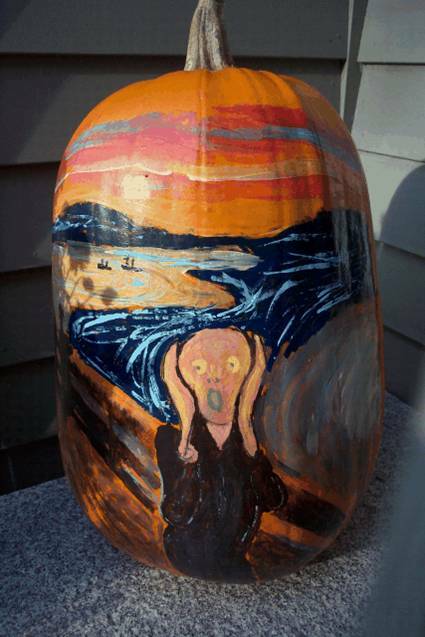 Yet, on the 150th anniversary of his birth, The Scream has a ubiquity only equalled by a handful of other works of art. Munch’s birth country of Norway is currently awash with Munch mania with special retrospectives of his works, plans afoot to build a new museum in his memory and a multitude of flash mob style scream-ins. So what could you do to commemorate Edvard and his most famous creation on his 150th cake day? Here are a few ideas. It has to be said that you may have to be in possession of some artistic talent for your homage to be successful (or even recognizable). 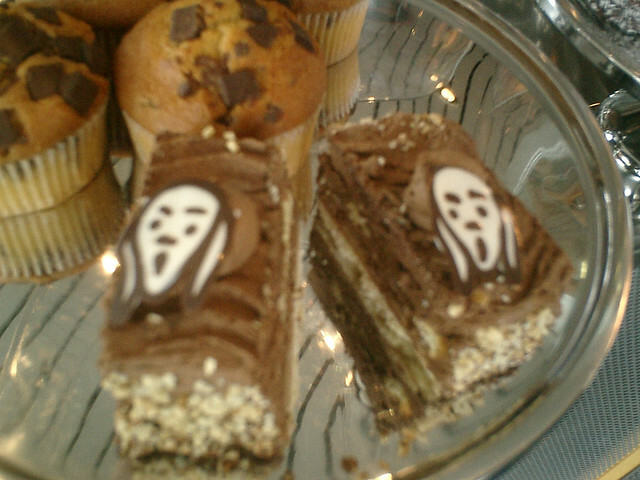 The decoration of various foodstuffs seems to be popular when recreating The Scream. 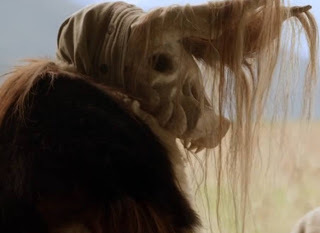 An agrarian, shamanistic society lives in thrall of the monster which visits the woods. When the monster arrives they must draw lots in order to choose the person who must enter the woodland and feed the monster. Monster was directed by Deborah Burns and stars Jodelle Ferland and R.Douglas Hutchison. It is a fable with a dark and humorous twist that will surprise and delight you. I certainly was! We have featured the work of Taylor Gonzales on Kuriositas before so it's great to see this new piece. 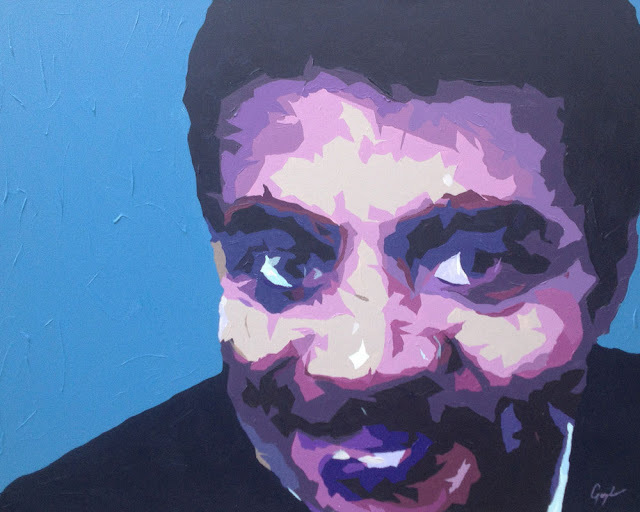 If you are not sure who Neil deGrasse Tyson is, then you are perhaps not on the right website! He is an American astrophysicist and science communicator. You may have seen him on a number of TV shows, including The Daily Show and the Colbert Report. He has also appeared as himself on Stargate: Atlantis and The Big Bang Theory. Tyson's research has focused on observations in cosmology, stellar evolution, galactic astronomy and stellar formation. He has held numerous positions at institutions including University of Maryland, Princeton University, the American Museum of Natural History, and Hayden Planetarium. We thought you might like to see Taylor's portrait of him - we think it's wonderful! This is seriously cool. Facehawk does what it says on the cover, as were. It takes your Facebook profile, blows it up and makes it in to a hawk – you can see what became of my profile above. It is the brainchild of Rajeev Basu who created it for Big Data and their track Dangerous. Big Data makes music about voyeurism in the digital age – and age of watching while being watched, of recording and tracking. Follow this link to the website. 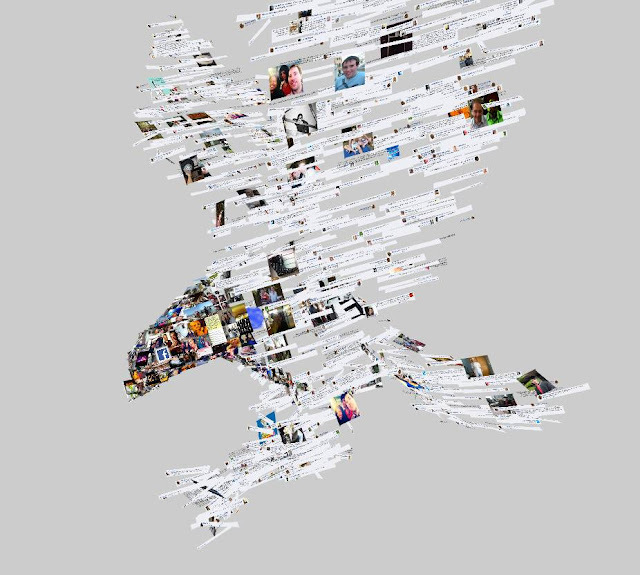 You will connect with Facebook and your hawk is created in real-time in your browser – Google Chrome is recommended. It is made up of your photos and your status updates from when you first connected with Facebook and serves as a reminder of just how much data you put online… Here’s a video if you would like a more visual explanation! To strike the balance in animation and to make your work both funny and sad is really an incredibly difficult trick to pull off. 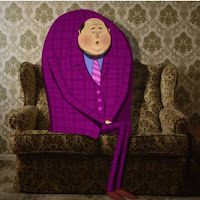 This short, by Steve Baker does just that, focusing in on the dating video of one Desmondo Ray. Some would categorise Desmondo as a potentially dangerous misfit but Baker very cleverly gives us a glimpse in to the inner Desmondo and what makes him tick. It’s a very funny, sometimes slightly alarming but ultimately poignant animation about the nature of difference and loneliness. Steve is a director at Taxi, an Australian commercial film production company which specializes in progressing and challenging work. I don’t think we have ever visited Greenland on Kuriositas so it is about time that was put right. This video is full of simply stunning vistas, many of which look like they have been created using computer graphics for a science fiction movie. The video follows Willem Vandoorne who is a much hardier soul than most from the evidence he presents here! 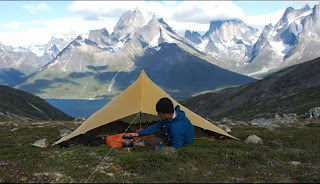 These are his impressions from a 25-day hiking and packrafting expedition through the wilderness of extreme Southern Greenland in July 2013. He started in Narsarsuaq, crossed over all the way to Tasermiut fjord, and continued with an 8-day loop east of Tasiusaq before finally paddling towards Nanortalik. I raise my cup of coffee in salute to you, sir – as even on my bucket lists of bucket lists I would be too terrified to attempt something like this! If you would like to read more about Mr Vandoorne and his travels, then pay a visit to his blog, Transscandinavia, where he goes in to them in much more detail. Kate and Tommy are not your average couple. However, can their love conquer the obstacles in their way? Unlikely if Tommy continues to solve and problem with a portable power tool. This is a very funny spoof (come homage) to the Texas Chainsaw Massacre and contains any number of movie references – you may need to watch this more than once to catch them all. Texas Two Step was written and directed by Craig Antioco. It stars Amara Cash and Jeffrey Baker as the odd couple. 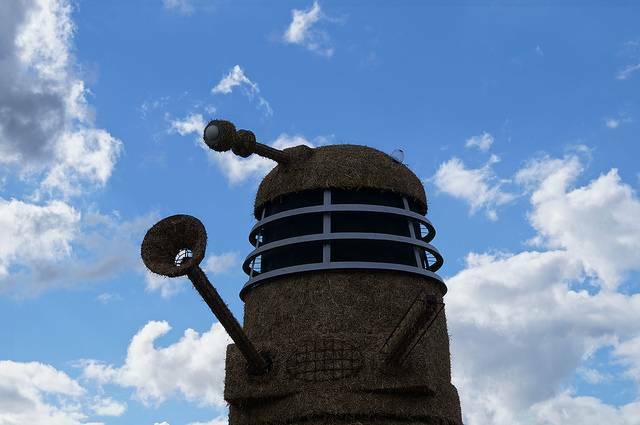 The owners of Snugbury’s, a farm-based ice-cream store which attracts hundreds of thousands of visitors annually to taste their splendid treats, decided to mark this anniversary with something special. 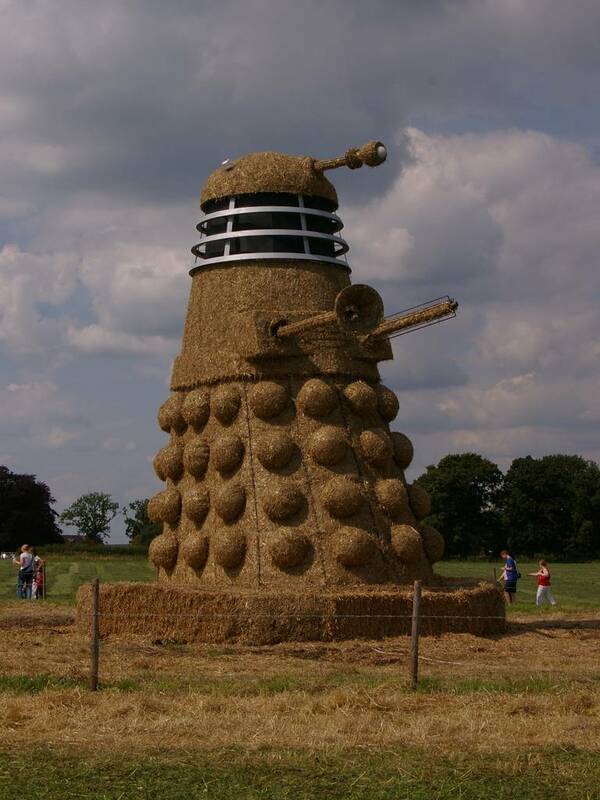 Visitors are used to their yearly straw sculpture displays but this year they have outdone themselves with this amazing homage to one of the world’s favorite and most long-lived TV shows. You might need a handkerchief for this. When Illinois based Green Shoe Studio ran a song competition they expected entrants to upload their finished tunes to YouTube. So when one person sent them a letter containing the lyrics of his song they were a little surprised. Then they discovered that the writer was a 96 year old Peoria resident Fred Stobaugh. 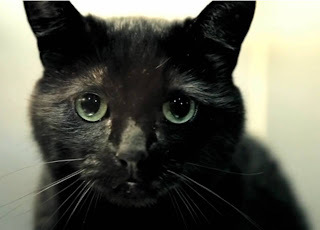 That no doubt made their jaws hit the floor but what really moved them was Fred’s story. 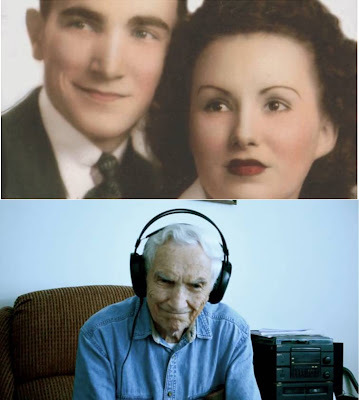 He had recently lost his wife and partner of 75 years, Lorraine. When he heard of the competition Fred felt compelled to write down his feelings about Lorraine, even though he wasn’t musical in the slightest, and send his song to Green Shoe Studio. The lovely people at the studio decided that they would record Fred’s song with professional musicians – and this is the story of how it happened. A Letter from Fred, directed by Oceanna Colgan, is not only a really heart-warming story of true community participation; it’s also a wonderful paean to enduring love. And yes, you can buy the song on iTunes! Every now and again new soul collectors must be recruited and trained and for this purpose they go to Death School – where else you may ask! 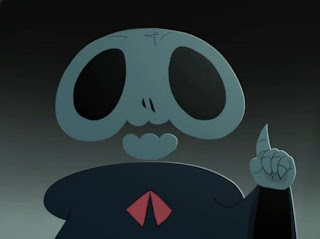 A new set of recruits arrives and the task of making them competent and proficient in the art of collecting the souls of the departed falls to a senior professor. 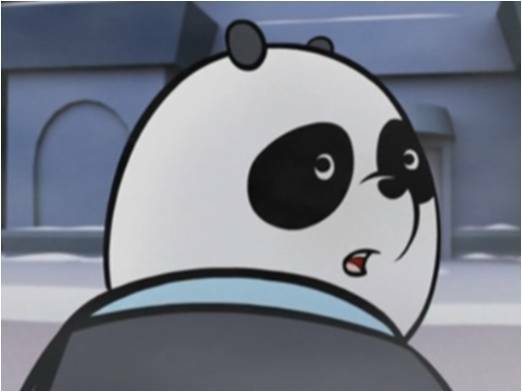 This very entertaining animated short was created by a group of students at the National Taiwan University of Arts, Department of Multimedia and Animation Arts. Arya has special DNA. Her genetic code allows her to survive the folding of temporal and spatial boundaries. In plain English that means that she can teleport – anywhere she wants. Her abilities are inherited but she is the last of her kind. Now, she explores new planets in the hope that she will find something that explains who she is and where she comes from. This somewhat inscrutable science fiction short movie did perhaps leave me with more questions than answers, but not unsatisfactorily so whatsoever, even though it is a brave filmmaker who leaves so much up to the imagination. However, director Raphael Rogers pulls it off and it’s great to see a science fiction movie with a female protagonist, here ably and enigmatically played by Bianca Malinowski (pictured above). A few Kuriositas readers have remarked, over the years, that we can sometimes be a little too earnest here, in our presentation of brilliant animation and fantastic independent short films. So, for a change, here is something which revels in its own silliness! The Day of the Bears is something of a cautionary tale. If you happen upon this pair of performing bears in the near future then take my advice – leave them a tip! 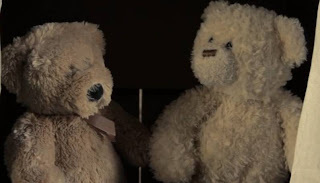 Day of the Bears was written, directed and edited by Atif Mirza and features Nikhil Dhawan, Kristineh Baghoomian and Tasneem Rahim. The bears are not credited but we will call them Mr Timmy and Pebbles. Just because. Had he lived, Michael Jackson would be celebrating his 55th birthday on August 29. Aggressive, a live action and design studio have created this amazing video, part tribute, design and narrative to pay homage to one of the greatest performers of all time. Behind The Mask is a song originally recorded by Michael during the Thriller sessions. 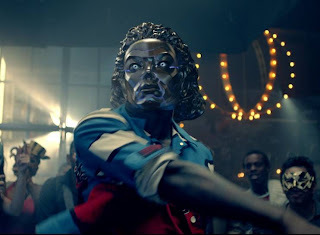 Enigmatic and bold, the video pays tribute to the various iconic masks Michael wore throughout his career, and features choreography by the The Jabbawockeez and Chucky Klapow. Mirror was created by Q-hyun Kim, aka Q, who is a graduate of the School of Visual Arts, MFA Computer Arts program in New York. He is currently working in the CG industry as a 3D Character animator. This is interesting. You probably know about Schrödinger's cat - a thought experiment, often described as a paradox, devised by Austrian physicist Erwin Schrödinger in 1935. 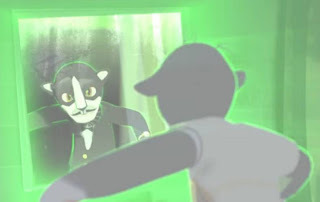 The scenario presents a cat that may be both alive and dead, depending on an earlier random event. The original experiment was, of course, imaginary. However, what director Britt Pitre and director of Photography Justin Dombrowski have done here is to (fictionally) recreate it - with something of a twist. The box in to which this particular cat is placed has one side made of glass, enabling the scientist to observe the cat as the experiment progresses. As you will see, although the box is closed it, the new addition to the scenario succeeds in opening something else – the metaphorical can of worms! I would have posted this up a few days ago but have been visiting the wilds of Wales where I was told that I had to hang up my blogging gloves for a while – but this is a gem. When the world is threatened by an evil hammerhead shark bent on flooding the world, it's up to SpyFox to stop him and save the world! This 60's spy film inspired short will be sure to keep you on the edge of your seat! 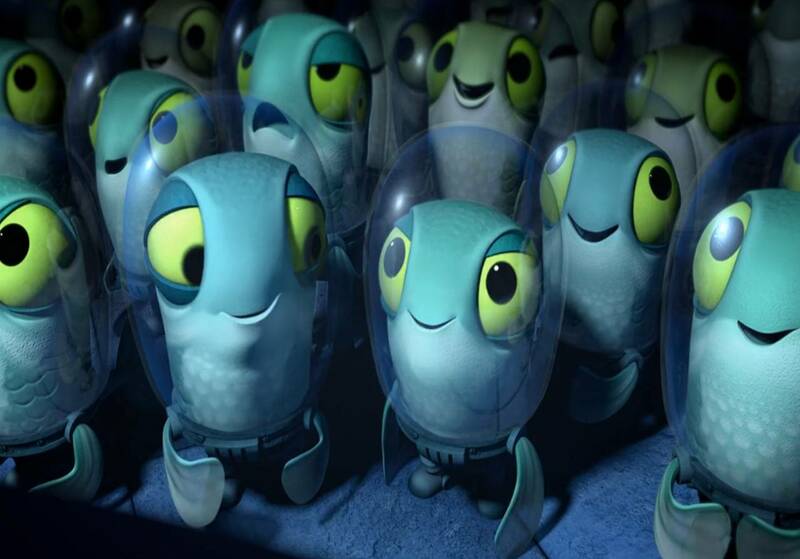 Oh and I just loved the sardine minions! SpyFox was produced by Yoav Shtibelman, Taylor Clutter and Kendra Phillips at Ringling College of Art and Design. If you are interested in joining in the fun then there is still a little time to submit your short movie for Filminute – the deadline is August 20 - so time is running out. The shortlisted films will be subject to both a public vote and a review by an international jury - luminaries from the film, arts, literature, and advertising fields. Here at Kuriositas, we can’t help but join in – we will be showcasing our 5 favorites from this year’s line-up at the beginning of September. Click the picture to get to the website and make your entry! 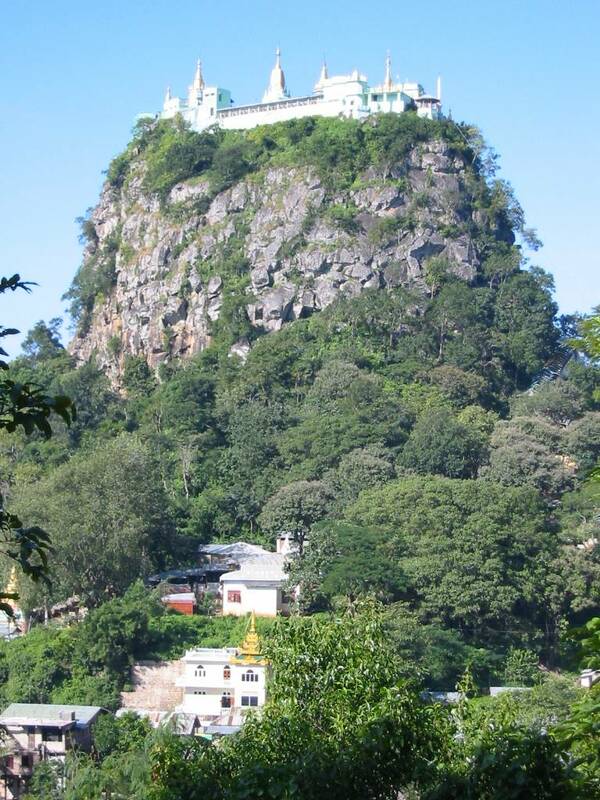 Yes, that’s right a volcanic plug. It sounds dangerous but at this stage in its life, Taung Kalat poses no threat. A volcanic plug (sometimes called a ‘neck’) is formed when magma, on its way up through a vent on an active volcano, hardens inside the vent. 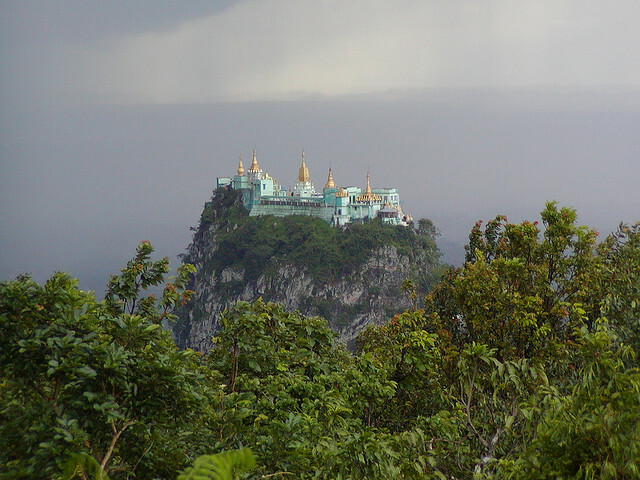 While the volcano is active this could well lead to the mother of all explosions and it would, you have to admit, be a shame if this beautiful monastery was to be catapulted in to the stratosphere. However, the volcano is thought (perhaps we should say hoped) to be extinct. When it comes to interfering with the development of other planets and species, most enlightened Federations have policies and laws to hold them in place. Other species, however, see it as their right to interfere with ecosystems even though it may well be in the most benign of manners. One such species is featured here. 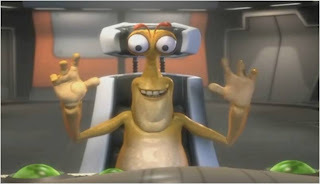 An alien visits a certain planet to give it a little push in the right direction. Only he/she/it didn't factor in the help. This short but very well done student animation was made by Matthew James Killian -at Ringling College of Art and Design. It won fourth place in the future@motion 2010 competition run my the people at motiontv. 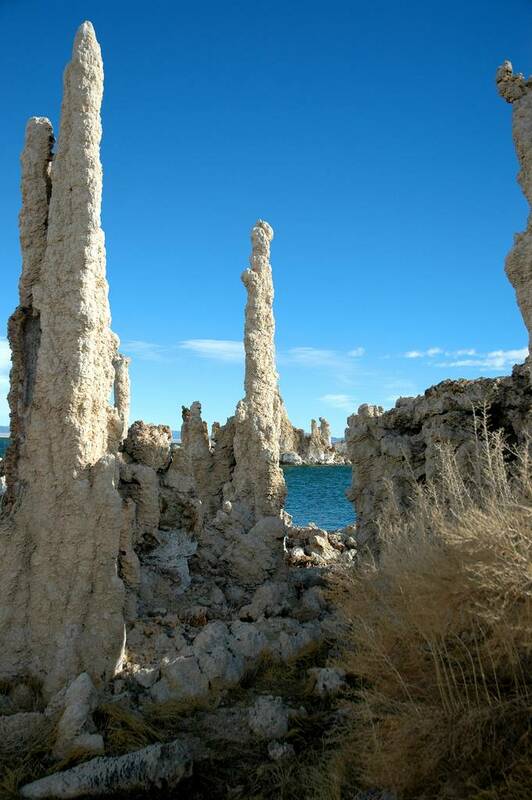 Mono Lake in California is a strange place to say the least. However, unlike many bizarre places in the world this strange environment is caused by us. In the early nineteen forties the city of Los Angeles was growing quickly. The Second World War was in full flow and when it came to the environment it was felt that some things could be neglected. The LA Department of Water and Power began diverting the lakes streams three hundred and fifty miles to the south. The damage to the environment would be untold. Paradoxically it would leave the area eerily beautiful – like some alien backdrop from an episode of Star Trek. 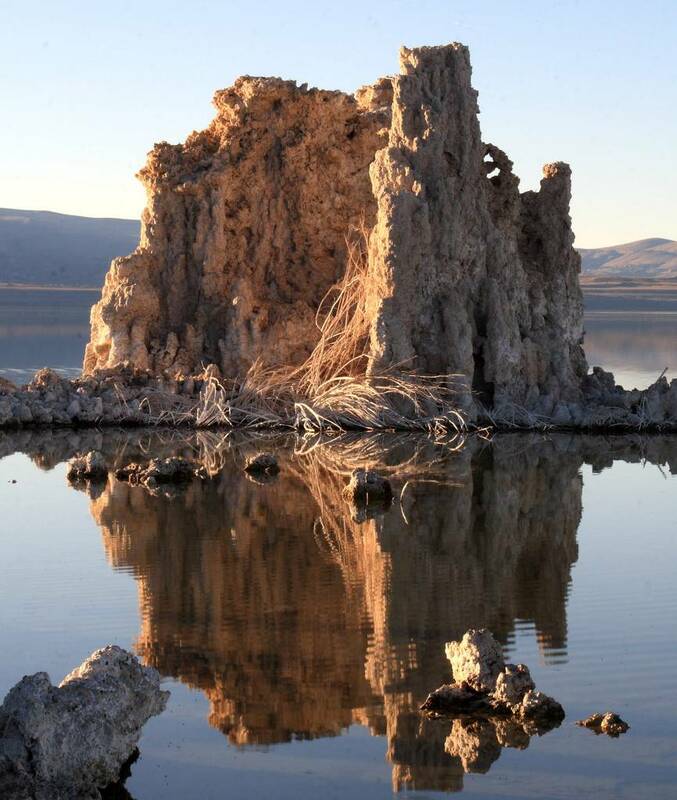 At some points in the year a soap-like layer forms on the top of the lake. We like to bring you thought provoking animations at Kuriositas, especially those which provoke thought as well as entertain. This is no exception. Set in Bosnia many thousands of years ago it tells the story of a prehistoric man thawed from the deep sleep of the last Ice Age. As anyone would, this everyman figure goes about reconstructing his society including his belief in a system of sun based worship. Then, as civilisations do, he comes across another and the two set about to reconcile their differences in a spirit of tolerance. Well, you can guess that doesn't happen. This fantastic animated short film by Ivan Ramadan has received a number of awards since its release in 2008. It has picked up seven, including a nomination for the Best European Short film by the European Film Academy 2008. Tolerantia (tolerance, we believe, in English) is a great piece of animation, thoughful and measured and wonderfully and crisply rendered. Ivan Ramadan is 25 and lives in Sarajevo, studying Architecture (something of a surprise considering this movie, one might have thought animation). He has been creating animation since he was a child and Tolerantia was his first full movie. Great work, Mr Ramadan. He is currently working on an animated series - Diamond Forest Drummers. 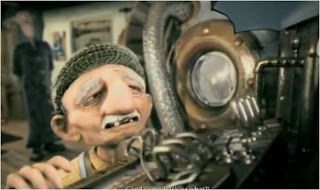 If you like stop motion animation, then stop here a while - you will find this short movie immensely enjoyable. 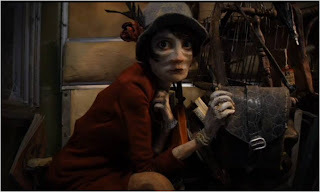 Madame Tutli-Putli was nominated for an Academy Award in 2007 and you can see why. It was created by Chris Lavis and Maciek Szczerbowski. Funding was provided by the National Film Board of Canada which surely deserves an Oscar in its own right for the tireless work it has done over the decades to promote Canadian film making. The eponymous heroine of the movie Madame Tutli-Putli awaits the Night Train. She is weighed down - literally by all her possessions and also by the ghosts of her past which haunt her. As night descends she is enveloped by a desperate metaphysical adventure. Between reality and imagination she is forced to confront her demons. 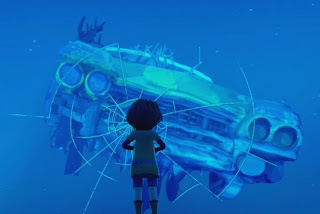 The journey here is both real and existential and the film introduced several groundbreaking visual techniques which took painstaking care and craftsmanship to bring to life. This is something for the season if you are a fan of both Hitchcockian suspense and Jungian thrillers. A man, survivor of some future apocalyptic event which has seen the Earth’s oceans rise and tidally envelop his city, lives to collect timepieces from the wreckage when the waters recede. His life is conducted very much against time but when he discovers that he is not, after all, alone – his priorities must change. 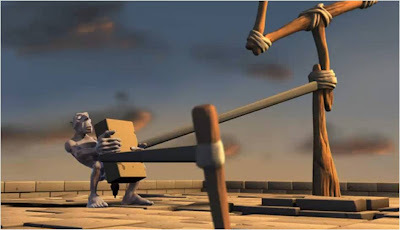 This is a wonderful animated short, created by six students at Supinfocom Arles. They are Jérémi Boutelet, Thibaud Clergue, Tristan Ménardm, Camille Perrin, Gaël Megherbi and Lucas Veber. Again, students from Supinfocom deliver something which can easily stand shoulder to shoulder with animated shorts created by seasoned professionals. Great work, people! Peter Capaldi is the new Doctor Who and that’s official. The 55 year old actor was ushered in to role with great fanfare on a special BBC 1 show (broadcast simultaneously on BBC America) simply but ingeniously called Doctor Who. 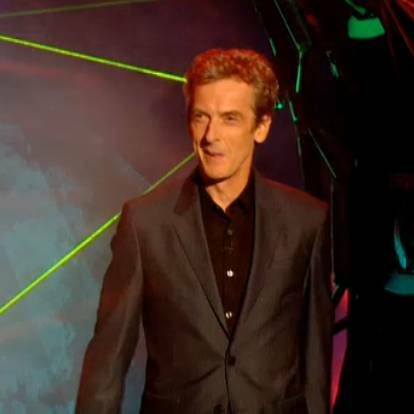 Perhaps the name of the special show wasn’t too much of a surprise but did you see the choice of Peter Capaldi coming? Well, the betting shops certainly did, having closed bets on the actor a while ago. Capaldi is well known to both British audiences and those over the world for his role as spin doctor Malcolm Tucker in the political comedy series, In the Loop. What is more, he is a lifelong fan of the show. In the late fifties, in the world famous Roller Derby Hall of Fame, the daily routine of an unassuming cleaning lady will unexpectedly go freewheeling, kicking-off her whole new life. If you feel something of the underdog at work at the moment, you may want to watch this! Free Wheel was created by a group of students at Supinfocom Arles last year for their graduation piece. They are Florian Pichon, Héloise Papillon, Lucas Morandi, Julien Perez, Maxime Mege-Yhthier and Jean-Baptiste Trullu.